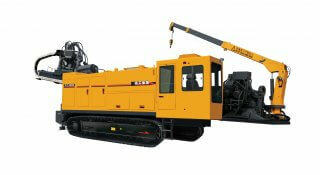 XZ1000 horizontal directional drilling rig with the integral and self-loading design, the whole machine has reasonable arrangement, compact structure and beautiful exterior condition, it adopts various advanced control technologies such as closed energy saving circuit, electro-hydraulic proportional control and load sensing control as well as the proprietary technologies of the company, and its main performance parameters and control technique have reached the international advanced level. The main components are of top-grade domestic and international brand, and high reliability. The engine is a six cylinder water cooled turbocharged Cummins engine with large power reserve, enabling the drilling rig to complete pipeline laying work under various complicated geological conditions. The unit head is driven with a low-speed high torque motor to rotate with high break-out torque. It runs at two gear speeds and has high construction efficiency. It is equipped with automatic protection for high pressure ensuring high reliability. Push-Pull adopts Rack-and-pinion push-pull, stepless speed regulating with two gears, making the operation more stable and efficient. High-strength drill stand is suitable for drill rods of different lengths, and cylinder driven sliding drill stand facilitates the adjustment of angle for construction. 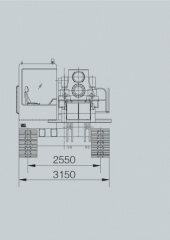 Vice and unit head double-floating technologies are adopted with effectively reduce rear of drill rod thread and extend the service life of the frill rod. The shackle is efficient and reliable. Various parameters of engine, hydraulic pressure and filtration are monitored with alarm so that the machine can be protected effectively.